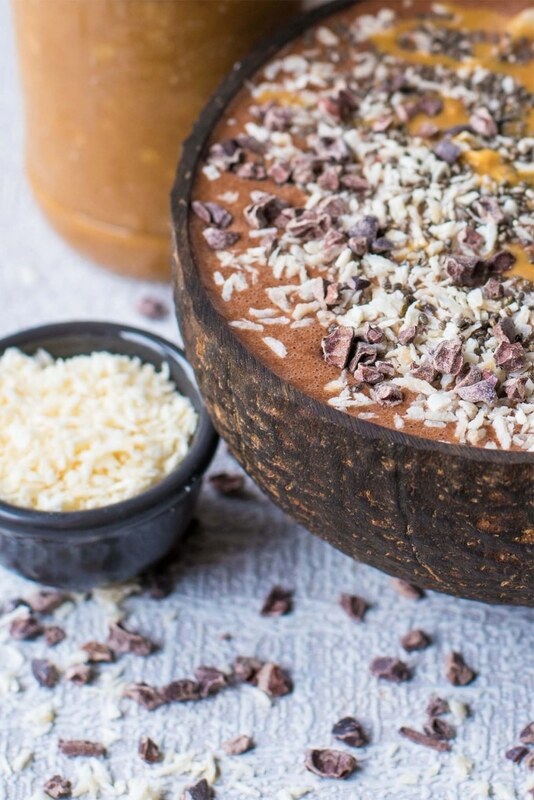 Whether you eat it for breakfast or dessert, this Chocolate Peanut Butter Smoothie Bowl will satisfy that chocolate craving, no matter what time of day it is. 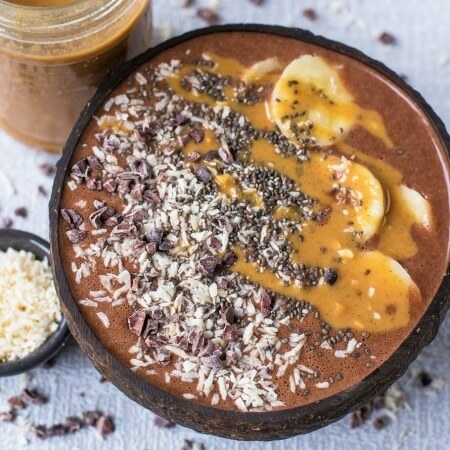 Loaded with creamy and protein-packed homemade peanut butter and banana for sweetness, this smoothie bowl can also be piled high with your favourite toppings. 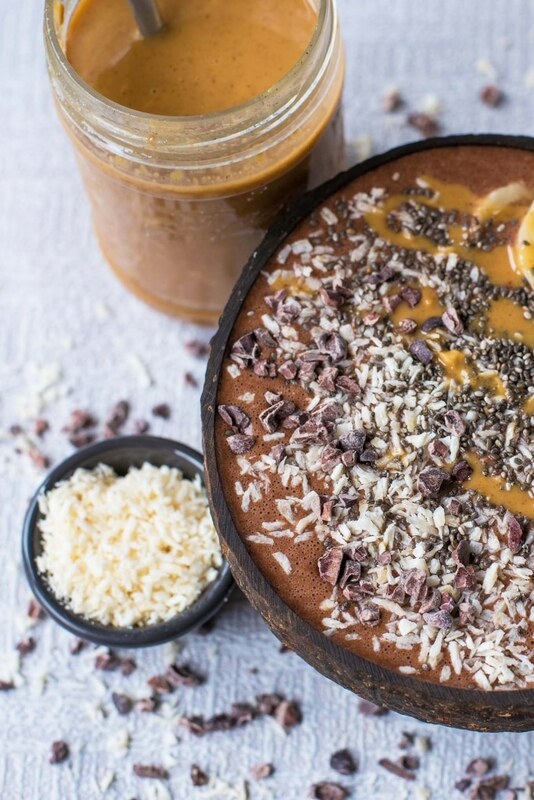 Before we really get in to this smoothie bowl, let’s talk about the toppings. Sure, you could just drink this out of a glass (mason jar optional but totally recommend for hipster status), but where is the fun in that? 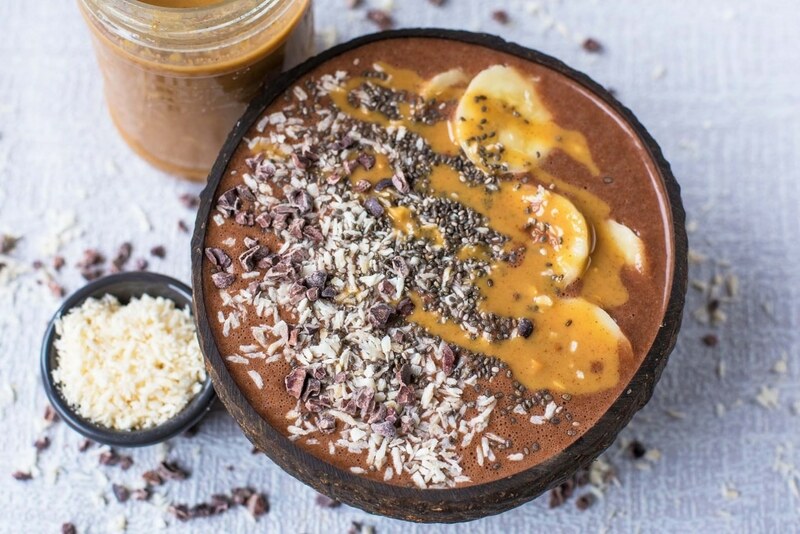 You can’t load toppings on to it when it is in a glass, and this smoothie bowl is all about the toppings. 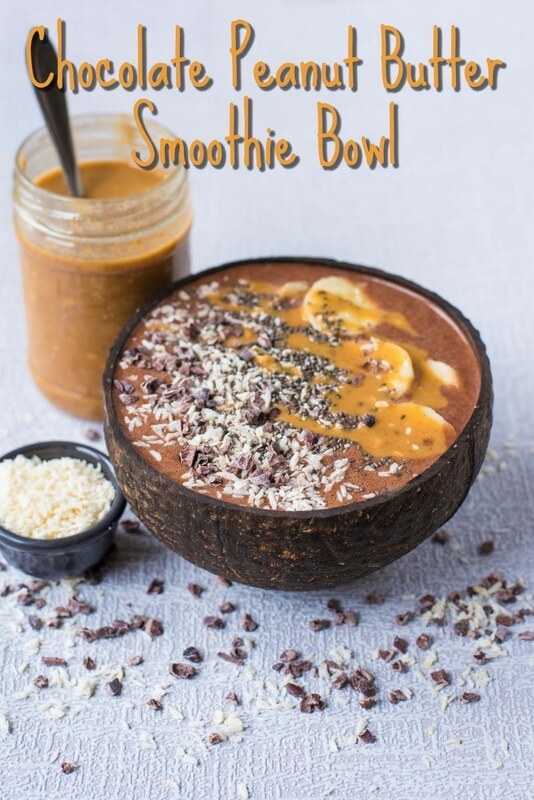 Serving a smoothie in a bowl makes it feel like much more of a meal that drinking it out of a glass, and it can be more filling with toppings galore. 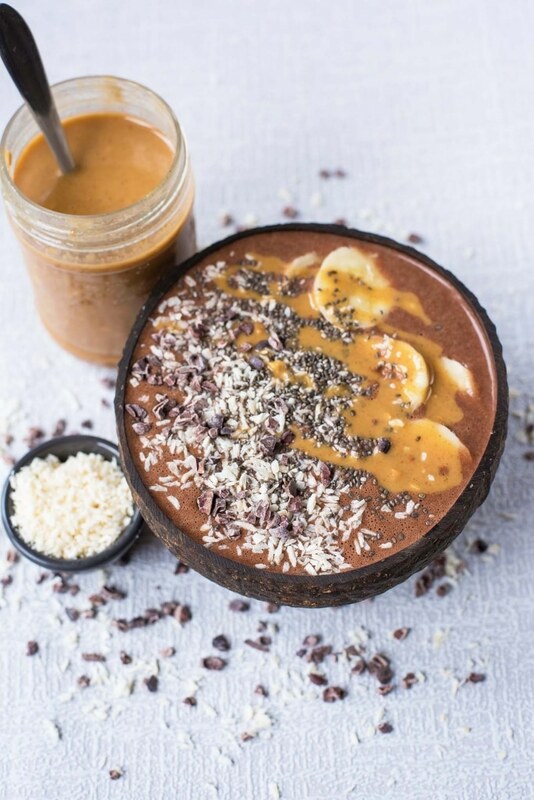 Do you want to be kept up to date on more delicious and healthy recipes like this Chocolate Peanut Butter Smoothie Bowl? Please subscribe to the blog mailing list (it takes 30 seconds). You will get sent the new recipes straight to your inbox. Your email address won’t be passed on to anyone and you will never be spammed. We love the creaminess that smoothies have when you use almond milk and Blue Diamond Almond Breeze Nutri+ Calcium has the added bonus of added calcium for the maintenance of normal teeth and bones, making it the first almond drink of its kind in the UK. People choose to follow a dairy free diet for many reasons, or simply cut back on dairy, and that can sometimes mean that calcium levels are low. Almond Breeze has got you covered now, as there is calcium right there in their delicious and refreshing almond drink. It is made with real Californian almonds, that they grow themselves and there is just 13 calories per 100ml. It contains 400mg of calcium per 200ml, which is 50% of your daily requirement. So, if you are struggling to get enough calcium, adding this to a smoothie, or just drinking a glass of it can top you up! It is fortified with B12 too, which is an essential nutrient often low in vegan diets. It gets better though, as a 200ml serving of Nutri+Calcium Almond Breeze contains 15% of your recommended vitamin D intake, which is perfect for us living in the UK and not seeing much sunlight sometimes. There is no added sugar and it is gluten and soya free too. 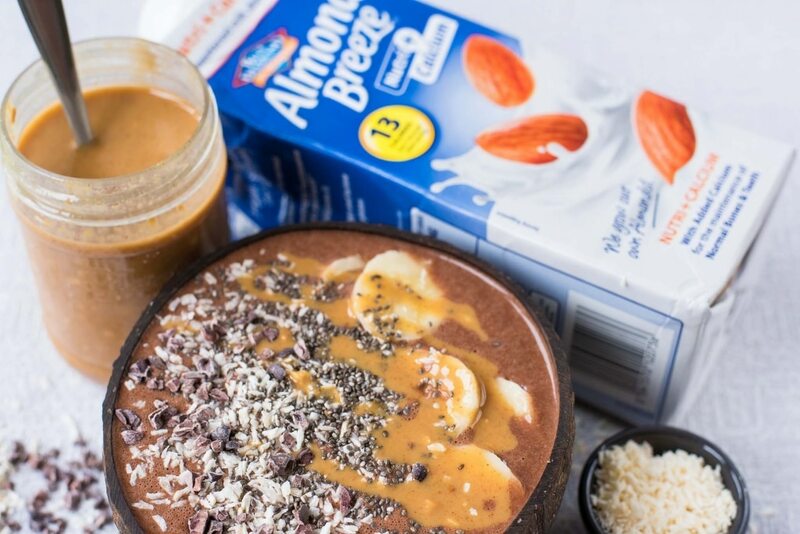 Give Blue Diamond Almond Milk a try in your recipes and wake up with a plus! You can find it in the ambient aisles of Waitrose. I have also just noticed that Almond Breeze do a barista blend too, which I am going to have to try next time I am in Waitrose, because that sounds like a great way to enjoy dairy free coffee at home. Chocolate and peanut butter is such a classic combination, but it is usually only combined in unhealthy things like brownies or ice cream *drooool*. 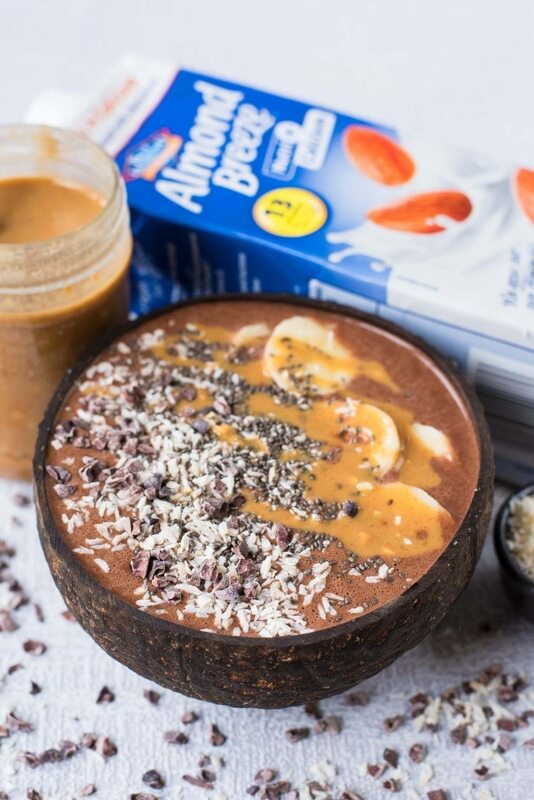 This smoothie is balanced and healthy, providing that you can exercise some restraint around an open jar of peanut butter. You can’t? No, I can’t either. Maybe we should start some kind of support group! We try to make our own peanut butter as much as possible, so we can control exactly goes in to it and that is just peanuts. Nope, nothing else! You need a pretty badass food processor to make it though, and I have broken a cheap food processor before trying to make nut butter. Oooops. But, it’s all worth it in the end. Take a look at our Homemade Peanut Butter recipe. Shall we talk about toppings again? I told you that I was all about the toppings. This is where you can really get crazy! I threw some coconut on there, because I knew it would show up well in the photos. Also because chocolate and coconut is a delicious combo. Then there was some carob nibs for some crunch. Then some chia seeds for a protein boost, then some leftover banana and then some more peanut butter for “aesthetics”. I told you I have no self control around peanut butter. 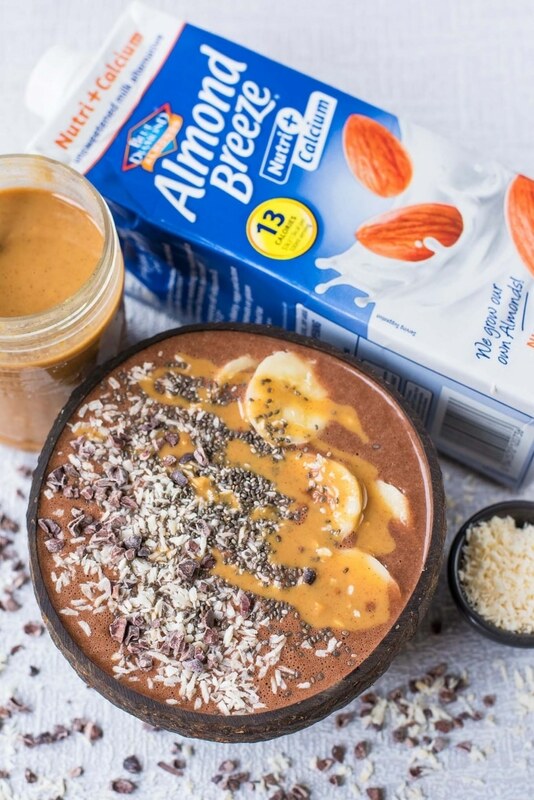 Whether you eat it for breakfast or dessert, this Chocolate Peanut Butter Smoothie Bowl will satisfy that chocolate craving, no matter what time of day it is. Put all of the smoothie ingredients in to a blender and blend until smooth. Wow so awesome!! Thanks for sharing!! Very inspiring! I love your recipe! Everything looked so yummy! !